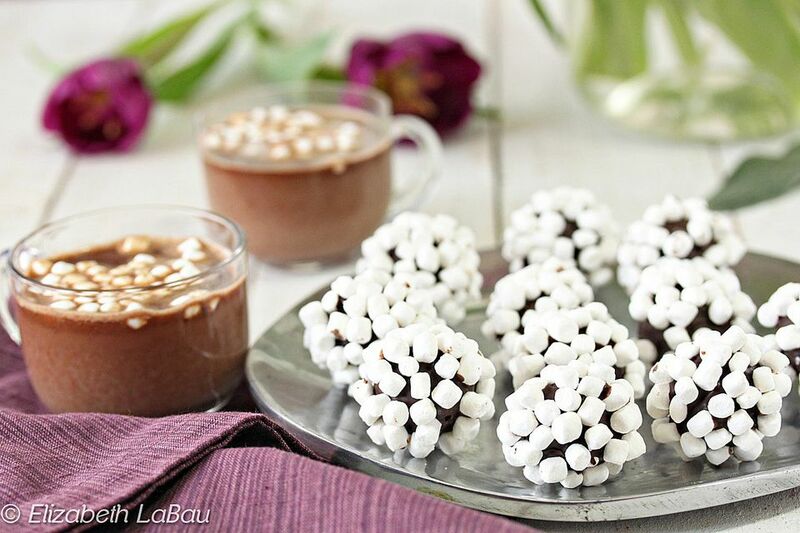 These Hot Chocolate Truffles melt in your mouth...and your mug! These clever candies do double duty as a truffle and as an easy way to whip up a mug of hot chocolate. Pop a few of them into a glass with milk, microwave for a minute, and you're left with a rich, creamy mug of cocoa. Place the chopped dark chocolate in a medium bowl. Pour the heavy cream and corn syrup into a small saucepan and place the pan over medium heat. Bring the cream to a simmer, and once small bubbles appear all along the sides of the pan, pour it over the chopped chocolate in the bowl. Let the hot cream soften the chocolate for one minute, then gently whisk them together, until all of the chocolate is melted and your ganache is smooth and shiny. Add the room temperature butter and whisk it into the ganache until incorporated. Press a layer of cling wrap directly on top of the ganache and let it sit until it reaches room temperature. Once at room temperature, refrigerate the ganache until it is firm enough to scoop, 1-2 hours. Dust your hands with a light layer of cocoa powder and roll the balls between your palms to get them round. If you have the time, let the truffles sit at cool room temperature overnight to dry and set the ganache—this will help them form a protective skin and make them easier to dip. If you don't have time, refrigerate the tray for 45-60 minutes until the truffles are very firm. When you're ready to dip the truffles, pour the Marshmallow Bits or other toppings into a wide, shallow bowl. Melt the chocolate candy coating in a microwave-safe bowl in 30-second intervals, stirring after every 30 seconds until melted and smooth. Scoop a spoonful of melted coating into the palm of your hand. Drop a truffle into the coating and use your other hand to roll it around your palm, until it's covered by a thin layer of coating on all sides. After a few moments, you can transfer the dipped truffle from the bowl to a baking sheet. Once all of the truffles are dipped and decorated, refrigerate the tray to set the chocolate for 15 minutes. Store these truffles in an airtight container in the refrigerator for up to a week. If you are going to be eating them plain, it's best to eat them soon after they are made, since the Marshmallow Bits will get soft and sticky in the humidity of the refrigerator. If you're going to use them to make hot chocolate, it doesn't matter as much since they will soften and melt in the chocolate anyhow. Microwave for 1 minute, then stir or whisk the contents until the hot chocolate is melted and smooth. Microwave strengths vary, so you may need to add a bit more time to get it as hot as you'd like. Top with additional marshmallows if desired. Click Here to View All Truffle Candy Recipes!